With over 100 years of combined concessions experience the C&C management team has the expertise and services available to enhance the quality and image of any venue. 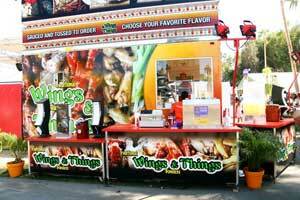 Since the 1960's C&C has serviced thousands of events and fed millions of satisfied customers. Whether your needs are comprehensive, such as complete food and beverage services, exclusive alcoholic beverage services, fixed facility management, or as simple as a single stand addition to compliment your current offerings. C&C is prepared to provide those services to you worry free so that you can focus on running your events with complete confidence in your service provider. Along with the standard hamburgers and hot dogs, C&C has created many signature items that have developed a following in the California and Arizona regions. Our Tri Tip is slow cooked over open pit hard wood BBQ's, sliced to just the right thickness, smothered in BBQ sauce, then generously served on a fresh roll for the customer to enjoy. Cooking Carne Asada over glowing mesquite charcoal is always an attraction for the customers, drawing them to the counter of our Fiesta Grille for street tacos to eat while browsing through a fair or maybe a car race. Take a look at some of our stands available below and see for yourself. 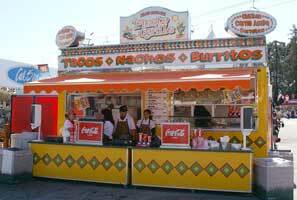 The American Cowboy Grill consists of a unique wood sided 12’ X 20’ food trailer with built in serving counters. 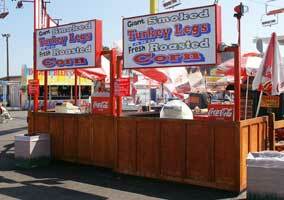 We further expand upon it with a selection of custom built corn / turkey leg kiosks and BBQ’s accented with our themed signage and rail fencing. 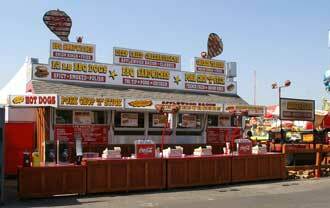 For a high grossing option this BBQ stand is very flexible in footprint sizes, ranging from approximately 40 linear feet to an expansive 100+ it accommodates the needs of the most demanding fairs. The Ranch is our flagship trailer measuring in at 8 ½' X 24' before unfolding the signs, it is an impressive sight on any main strip. The trailer is a complete kitchen with 5 double fryers, 9 bay steam table, refrigeration, slicing station, and a large pot sink. Accompanying the trailer are custom built serving counters with built in soda units, bib pumps, cup dispensers, and lighting bars. Matching condiment station doubles as an ADA compliant serving counter when required. 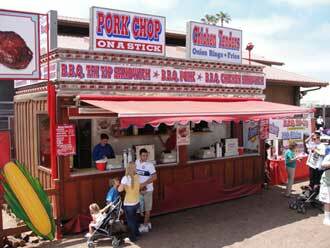 This stand is commonly used with or without the corn / turkey leg kiosks as needed providing the ultimate in fresh cooked BBQ for your guests. The Kiosks are a very unique service option that C&C originally designed and built to expand our BBQ locations increasing sales significantly and enhancing the overall customer experience. It wasn't long before facilities were inquiring about using them as independent points of sale. Many different layout options are available offering a flexible solution to locations requiring a high volume stand in a unique configuration. Set ups can vary from a compact 20' X 20' to over 100' X 40' with significant presence. For over 30 years this has been a favorite of many. Our Fiesta Grille brings fresh Carne Asada to your event in a fashion that will be remembered. From the tradition color scheme to the outside mesquite grill, this offering captures the attention of customers at any event. Carne Asada is marinated then cooked fresh just prior to chopping for our tasty street tacos or hefty burritos. Take a look at this very popular choice while planning your next event. 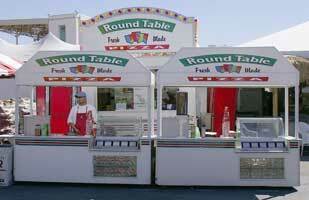 Those looking for a traditional concessions offering of pizza may find our Round Table Pizza as the perfect fit. The trailer can be oriented as an end or side serve. The matching carts are used as counters and compliment the trailer nicely. With the addition of a BBQ between the counters, sausage can be prepared fresh for your customers to enjoy as well as adding increased revenue for the facility.